Seviyan kheer is a humble Indian pudding made with vermicelli cooked in milk till it gets soft and then garnished with dry fruits. This recipe is not only easy to make it but is a real time saver too. Seviyan kheer needs no special occasions it is part of every day daily Indian menu. Kids and adults all love it. It can be made under 30 mins. Here is the basic recipe for Indian vermicelli kheer. But it can improvised a lot by adding different ingredients like kesar, mango puree, rose flavour. Lets learn how to make seviyan kheer. Heat the ghee in a heavy bottomed non-stick pan over medium heat and add seviya and fry till golden brown, stirring constantly. Pour the milk, sugar, almonds, raisins, pistachio and stirring constantly bring to boil. Cook for about 15 minutes or until the milk is slightly thickened. Cool to room temperature, add rose water and chill thoroughly in fridge before serving. 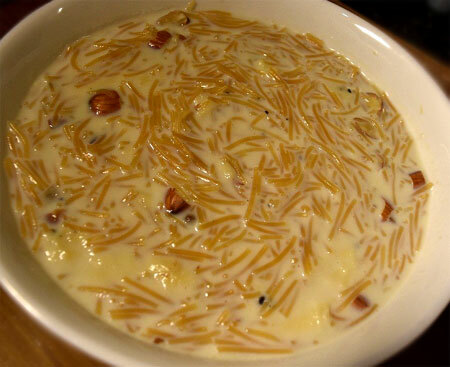 Pout the vermicelli kheer in individual bowls and garnish with chopped almonds.